Pilots from as far away as Alaska and Japan have heard of Enriques. A few years ago, Enrique Avila opened his restaurant on a Sunday to prepare lunch for twenty-six hungry Russian pilots who had changed their flight plan just to see if the rumors of great food were true. What else could alter a flight plan but good food or bad thunderstorms? They werent disappointed. Like most success stories, the route to fame didnt come without struggle and perseverance. Enriques journey was more of a struggle for survival than it was a plan for culinary acclaim. After an uncertain arrival in the States  following an attempted swim from Cuba, highlighted by a seaborne rescue  Mr. Avila settled in Wichita with relatives. When the job market began to falter in the early 80s, Enrique was encouraged by his sister to move his family to Ponca City and live with her until he got on his feet once again. 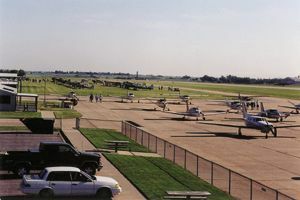 Coincidentally, the Ponca City Airport Board wanted a new manager for the failing airport restaurant, and the current manager was wanting out of his contract. With a years free rent and a borrowed $150, Enrique launched into a venture that was not exactly what he wanted to do in life; but I had to do something, he said. After a visit to Taco Bell and Taco Tico to get an idea of what prices to charge, and with the borrowed $150 from his sister, he hung his hand-drawn posterboard menu on the restaurants wall. With few tables and fewer customers, Enriques Mexican Restaurant was open for business. The first day we made $17.00, all in soft drinks and coffee sales, Enrique said. With no money for advertising and being located out of the main traffic flow, business was slow. 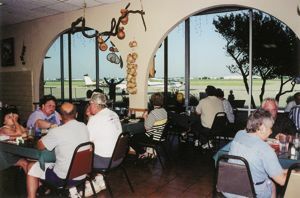 Then, word began to spread around town that this little airport restaurant had great Mexican food, along with the best onion rings and hamburgers in town. Pilots talk a lot, passing along information on good eats as well as their typical war stories. Soon, Enriques was wall-to-wall with people, and growing. Now the 100-seat restaurant lands nearly a million dollars a year in sales. For pilots Ive got the right location, and the community responded well to us, Enrique said. He continued, After almost 20 years of service, I guess we are here to stay. The airport people have been generous giving us all the available space, except for the airport museum and the airlines ticket counter. Weve expanded three times. Who knows, next time we may go up. There is talk of building another restaurant, perhaps a Cuban restaurant in Oklahoma City. Typically, there is a 15 to 30 minute wait to be seated, and there are no reservations. However, the wait is worth it. Where else can you sit at a table, eating handmade puffed tortilla chips, sopapillas made from fresh oranges, and enchiladas that are made from scratch while watching airplanes go by? The Cu-Mex cuisine is layered in flavors, rich and hearty, without being heavy and grease laden. The food is neither too hot nor too spicy, but each ingredient compliments the other in a manner that satisfies most every taste. The menu has a huge variety of combinations of dinners, as well as a wide range of single items. Prices range from $2.50 for a hamburger to $10.99 for the shrimp Fajita. The wait staff is friendly, efficient, and professional. On our visit, I had Pollo Loco Chicken Soup (their most requested menu item), Green Chicken Enchiladas, and Mexican Rice. The chicken soup is so good that a customer once threatened to get physical when he learned that they had run out of his favorite soup. Enriques opens Monday through Saturday at 11:00 am (there is a Pancake Breakfast Fly-in on the first Saturday of each month, 6:30 - 10:30). Weekday hours are 11 am to 2 pm for lunch and 4:30 to 8:00 pm for dinner (9:00 pm on Friday nights). On Saturdays, Enriques has to stay open from 11:00 am to 9:00 pm to keep die Lunchwaffe fed.